RacerXonline man Davey Coombs possesses a massive collection of old-school moto memorabilia, and this week during another (failed) attempt to "clean out his office" he ran into another gem: a track map and obstacle descriptions from the 1984 Anaheim Supercross press kit. They don't build supercross tracks or supercross press kits like they used to! We've posted the text and the track map here for this week's The List. The green arrow ain't got nothing for it. 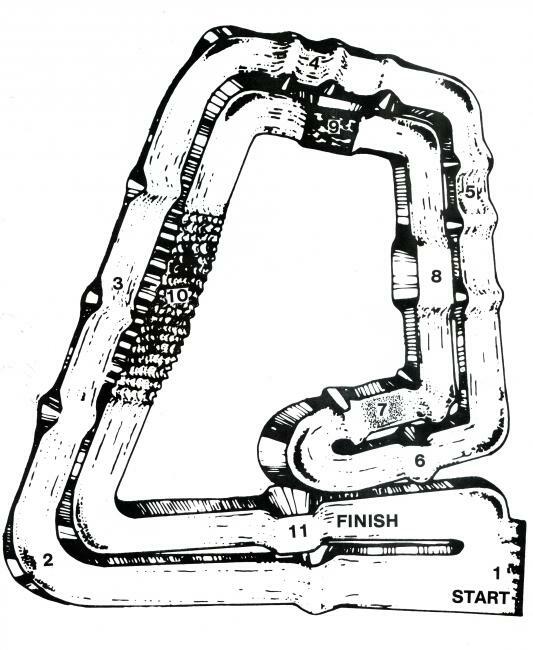 The Anaheim '84 track map. MILLER HIGH LIFE MOUNTAIN: The biggest, meanest chunk of real estate ever to inhabit a stadium! You hit the near vertical front wall and launch into a mind-blowing skyshot that carries you over the finish line on the top of the entire plateau! But it's not over yet.....You land with just enough time to skid into the last hairpin turn, and roost out onto the start straight! Note: It does get you kind of pumped up, doesn't it?